I have dove by the droves three kinds, Morning, White Wing, and Eurasian. they raise in my pine trees seems about three broods worth. In the evening high lines lined with them, wake up every morning to their various sounds. They are smart city allows no killing of birds in city limits. There are so many sun flowers planted around here, it's about a waste of time to plant them at all. Now if I could figure out how to get enough of these seed https://missinghenrymitchell.com/201...eeded-mercury/ to grow a good sized patch I'd have every dove in the county there. This is one of doves favorite! Many times when there's a hot corner in a field, its because of this weed, not the crop that's planted. My Wife and I feed the birds here at home. To the tune of 50# of sunflower seeds every 2 weeks. We also buy several cases of Grape jelly during the Spring for the Oreoles. We have a few pair of the Eurasian doves. The home fed ones are as big as Pigeons. I like to hear them cooing. We have had an Owl but I have not heard him lately. Lots of Humming Birds, Finches, Cardinals, Mocking Birds, Blue Jays, Gross Beaks, Purple Martins, Indigo Buntings, and of course all of the Democrat birds like Sparrows and Black Birds. We're also supporting a few pair of squirrels. Wife won't let me harvest the Doves or Squirrels! I took this picture last Thursday. Man, put my chair under the shade tree and bang away. I have about three or four sunflower plants growing now under the bird feeder from spillage. Had to stop filling it up for a few weeks as doves were emptying it to fast and other birds not getting a chance. 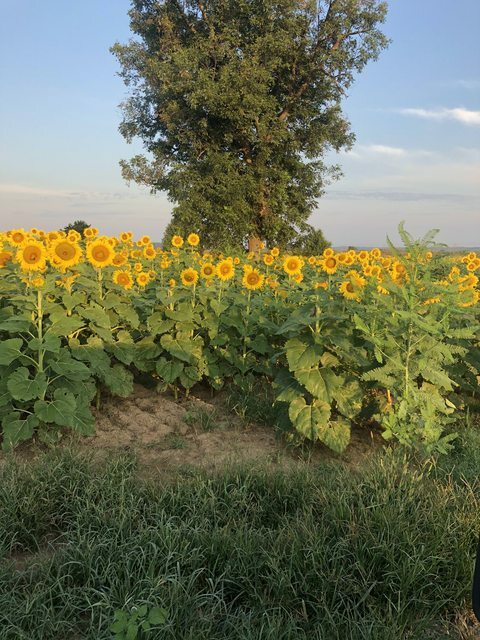 Now you guys give me a idea of what to do next year of to plant some sunflowers in part of my land and see how many dove will show up.I do have about 2 for sure show around me. That is all.I still got on line to put in to shoot them if I see any when out in the woods. We can use lead on them here also. Hunted wild sunflower patches all my life , The country is covered with sunflowers . Stock tanks (ponds) in the morning and evening . Sunflowers, mesquite trees and a good fence row.. If you've got a thick wallet, look up Argentina dove hunting. A buddy has done it twice. In four of five days you can shoot thousands of doves. You can shoot until you can't lift the gun anymore and the flocks just keep coming. "I don't touch shells". My buddy thought he was a wack job until he watched the guy shooting a very fine double. Every time he opened it to eject the empties, a kid was standing to load two fresh rounds into the chambers for him. Nice to have money. It was a 28 gauge, so he was paying a premium on the ammo as well as having his own personal loaders. Growing up we went down to the Colorado River every LABOR DAY to hunt dove. Started when I was 12 yrs old(1966). Did it every year until about 1990. It started to turn into a drunken party on the river with bums wandering around blasting at anything. Drunk girls in ski boats. Haven't Hunted Dove since. Just Pheasants. I'd better get out some claybirds and get in some much needed practice. As a teen, we hunted an old farm and at times you didn't have to aim. The doves were so thick all you needed was to point skyward and squeeze. It looks like we caught a much needed rain last night and this morning. Now for for some sunshine and come on Doves! For several years I would get on a hunt near Lexington KY. It was always good fun but one year we hit the jackpot and took 102 doves in about 2-1/2hrs. At 5:00 we had to report to the main house for drinks and Hour devours. This farm has been in the same family since the 1850s as well as the house in the picture. Good times for sure! We usually have a few of my friends daughters or wives, some children including a Grandson or Daughter, and several adults. We make it a family friendly deal. Most everyone of age drinks after we are through shooting but no one gets loud or obnoxious. Most of the hunters that can shoot get their limit and everyone gets some shots. We start the afternoon before by going to shoot clay targets then retire back to my house for drinks and burgers. After the hunt we have a cookout on my back porch. A few times some of the guys want to hunt the next day or even the day after that. I'm ready!